Areca palms or Chrysalidocarpus lutesces is quite an easy palm to grow and care for. This is especially true if planted outdoors in warmer climates, as it is highly adaptable to many environments. Areca palms do best in zones 9 and higher. It can be grown in either full sun or partial shade. Areca palms grown indoors are relatively easy to grow but will require some care. These palms can be used in the landscape as specimen trees or screens. Once established, their needs are quite basic. Amend the soil with cow manure semi-annually where the areca palm is growing. They will do best growing in a fertile soil that drains. Fertilize the areca palm semi-annually with a high quality palm fertilizer containing high amounts of magnesium, manganese and potassium. Arecas will suffer frequently from potassium deficiency, but regular fertilizing will solve this problem. Water the areca palm every other day when it is first planted. After several weeks, cut back to twice a week. They grow best in moist soil but will not tolerate flooded conditions for too long. Once established, once a week watering will be fine. Prune the new shoots as they develop if you want an areca with only several trunks. Prune off only the dead branches if a naturally clumping areca palm is desired. Grow the areca palm in a container that is at least twice as big as the root ball. For proper growth, the roots need room to grow. Use a potting mix that drains well. Using a thicker soil may not drain appropriately and the areca can suffer root rot and die. Water the areca with bottled water containing no salt or minerals. 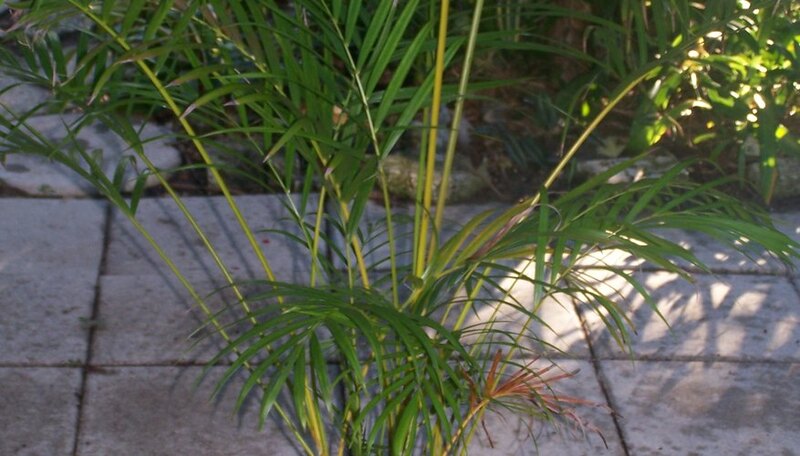 Areca palms can develop brown spotty leaves due to the salt and minerals in certain waters. Keep the soil moist but not continuously flooded. Watering the palm once per week should be sufficient for indoor growth. Fertilize the palm once per week with a water soluble fertilizer such as Miracle Grow. This will assure the palm is receiving the proper nutrients. Place the areca palm in an area that receives high light. Glass doors or windows will be a suitable growing location. Prune off any yellowing or dead branches. Take the areca palm indoors if living on a porch and a freeze is expected. Areca palms will not survive in freezing temperatures for too long. Pests are usually not a problem with areca palms, especially if grown outdoors. Indoors, mealy bugs or scale may appear on the underside of the foliage. If this happens, treat the palm with an insecticide developed especially to treat the condition and designed to use on areca palms. Plant the areca palm in an area that is big enough. They can reach a height of over 20 feet and have a width of six feet.